The officials do their best to reduce the scale of the tragedy, hide facts of arsons and crimes. The human rights advocates, reporting their observations and directly communicating with the residents of southern Kyrgyzstan, are also in danger, says Tolekan Ismailova, the head of Citizens against Corruption center. 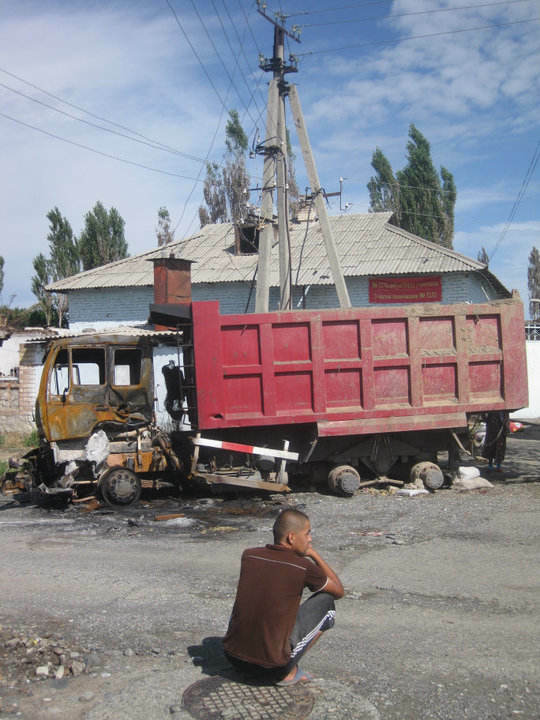 - Today we observed the Emergency Response Ministry workers going around mahallah (Uzbek residential districts) and villages and asking people not to report arsons, but to say these were accidental fires in order to be able to get compensation – she told Ferghana.Ru. - In fact, this way the officials are trying to avoid paying compensations. Tolekan Ismailova and her colleague Aziza Abdurasulova were recently invited to the district prosecutor’s office. They viewed the possible reason in the fact that they asked for release of three Uzbek guys, detained illegally. However, in the prosecutor’s office they had to deal with two unpleasant issues. First, the human rights activists were asked to explain why they provided distorted information to 24.kg news agency about the number of victims at the Nariman village. Secondly, it turned out that Ismailova and Abdurasulova are the witnesses in the mass riot case, filed on June 12. Overall, Aziza and I spent 3 hours in the interrogation room. We still have no idea why human rights advocates are involved in the criminal cases – said Ismailova. 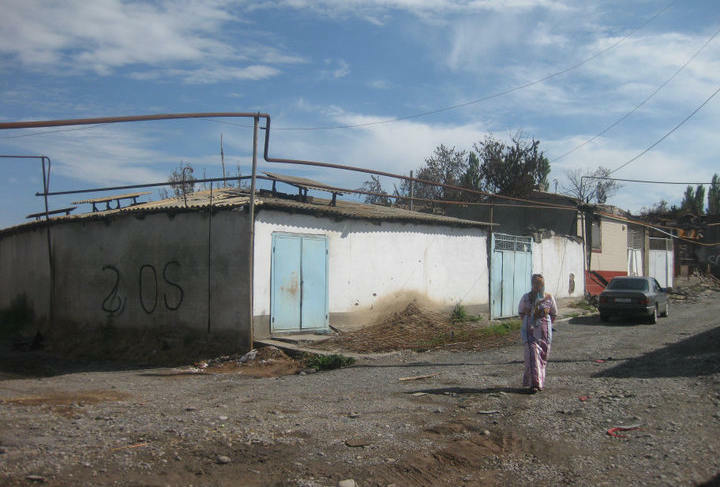 According to her, there are very few human rights advocates from Bishkek, working with local colleagues in Osh and witnessing the scale of devastation there. She said that human rights activities are resisted by few officials and mentioned the detention of Azimzhan Askarov, the head of Vozduh NGO. In the opinion of Ferghana.Ru sources, Azimzhan Askarov’s story is the case of "police revenge" when policemen look for guilty not among criminals, but among "eternal enemies" – journalists and human rights activists. It has to be mentioned that few years ago Azimzhan Askarov had problems with Jalal-Abad police because he covered the tortures in the detention centers. Tolekan Ismailova underlined that Askarov’s case is being studied by French human rights organization, while Russian activist Oxana Chelysheva, invited by Citizens against Corruption, is preparing the report on Askarov’s case and human rights conditions in Kyrgyzstan, based on the request from European parliament. Tolekan Ismailova informed that often times she is recommended "to talk less". - When we were leaving Papan village at the referendum day we had to pull over the car because there were five screws in the tires. Later on we were invited by the prosecutor’s office. We are very concerned. The open policy, promoted by Roza Otunbaeva in coalition with NGOs, will be resisted by people that want to continue controlling Osh. The evidence of Roza Otunbaeva’s interest in the human rights activities is the fact that she personally assisted to the access of human rights advocates to the temporary detention center of national security service. The appropriate agreement was reached on June 27 during the meeting of activists with law enforcement structures and interim president in Osh. - Otunbaeva was supervising this issue. She called Tolekan Ismailova and made sure the general performed her order to let Ismailova visit the detention center – said Sanobar Shermatova, Moscow-based journalist and expert on Central Asia, which also visited temporary detention center together with Human Rights Watch people. According to Shermatova, there are 33 detainees in total: Kyrgyz, Uzbeks and others. The cells are not overcrowded. The human rights leaders also met OSCE physician, which was helping the detainees. However, the visitors were indignant that the OSCE physician was trying to hide the injured and beaten detainee that did not remember why he was there. 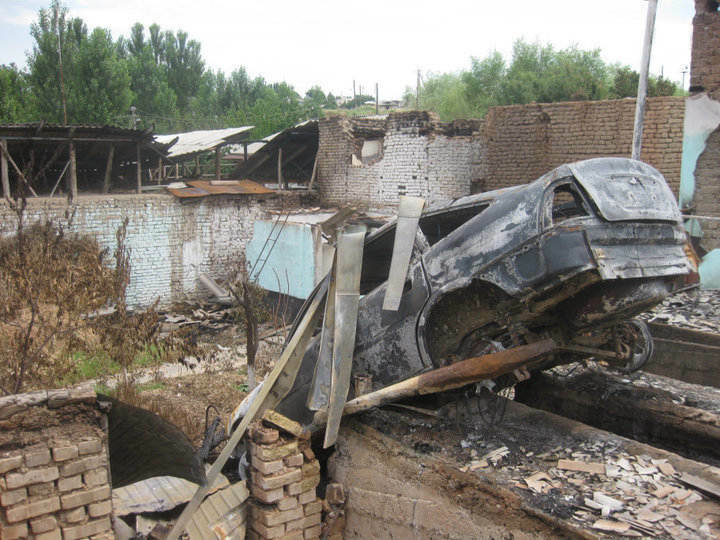 - We are concerned about the wide scale detention of ethnic Uzbeks – says Tolekan Ismailova. – They are illegally arrested. The police toss the drugs and weapons to them. Their parents are asked 10 000 som ($1=46 som) to $5000 for their release. The guerilla war, kidnapping, blackmail are awful; police and soldiers continue violating human rights. 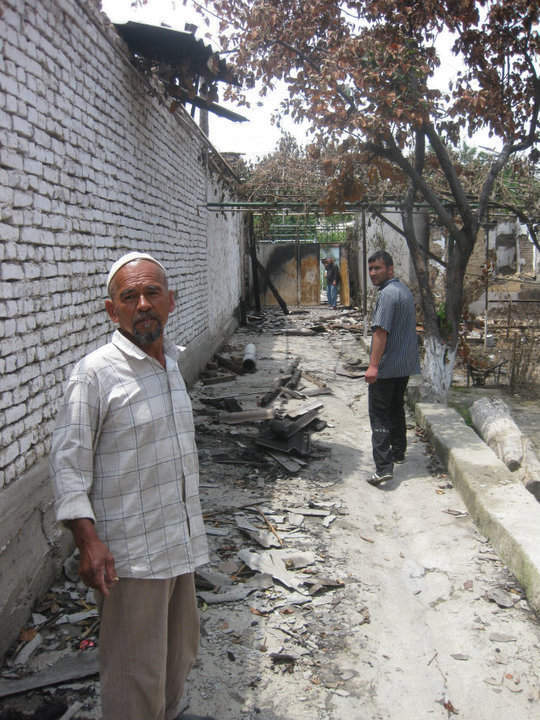 - Do they continue the cleansing in the Uzbek residential districts? - Yes. What does that mean? We want law enforcement bodies to officially explain it. People are scared to understand it as "ethnic cleansing" as the police continue killing, tearing passports. The civil activists understand the cleansing as the identification of criminals and big group of instigators. We are stunned when the civilians suffer violence from mono-ethnic army and police. - Why are army and police in Kyrgyzstan mono-ethnic? - We are investigating this big issue. - Where are the refugees that returned from Uzbekistan? - In various places. Most of them are in temporary camps and hosted by relatives. There are very few cases when some of them are provided with medical aid. - What are the conditions in the camps? - It is problematic to state they meet the minimum human rights standards. Today, UN programs representatives were meeting to discuss this issue. - Are there camps for Kyrgyz? - Yes, there is a guarded camp in Aitilek. Humanitarian aid is delivered there. - Unlike in Uzbek camps? - Not to this extent. - Uzbekistan still gets aid from various countries. Does it transfer it to Kyrgyzstan? - I do not know. 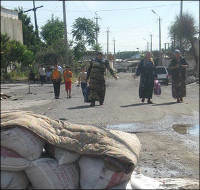 Our group, headed by Gulgaky Mamasalieva, is monitoring the supply of humanitarian aid. We cannot say it is enough for everybody. 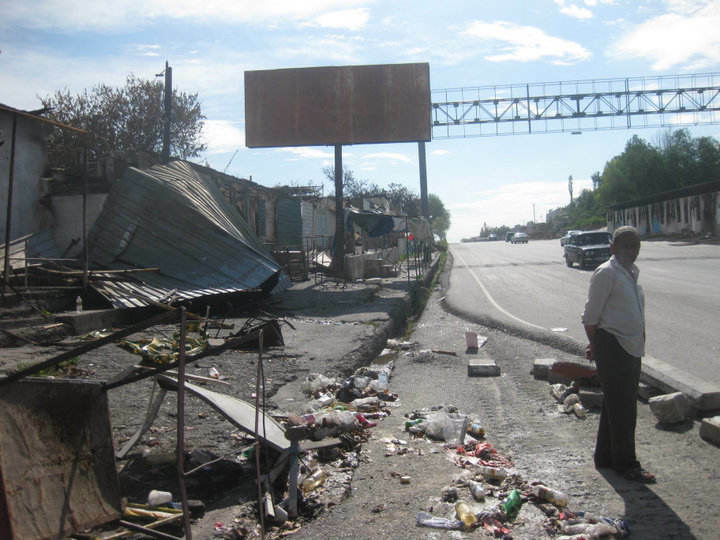 Today, life in Osh is going back to normal condition, but it is not what it was earlier. According to Shermatova, there are cars and people around the streets, but central market is closed. Many people in service dress are armed. - Are Uzbeks still afraid to leave their mahallah? - We visited one mahallah recently, populated by both Kyrgyz and Uzbeks. You can rarely see Uzbeks in Osh although there are many people in the streets. One older Uzbek woman told me she is trying not to let her grandchildren walk. Nearly all Uzbeks I asked said that at the referendum day they walked outside to vote. - The referendum results are positive – Ismailova notes. – People said "We are going to vote for lawful Kyrgyzstan, because chaos took away our lives and faith in the future. There is a hope, we will attract attention and our rights will not be violated".